This image shows the epithelial cells which comprise a sebaceous gland. Epidermis is toward the right. 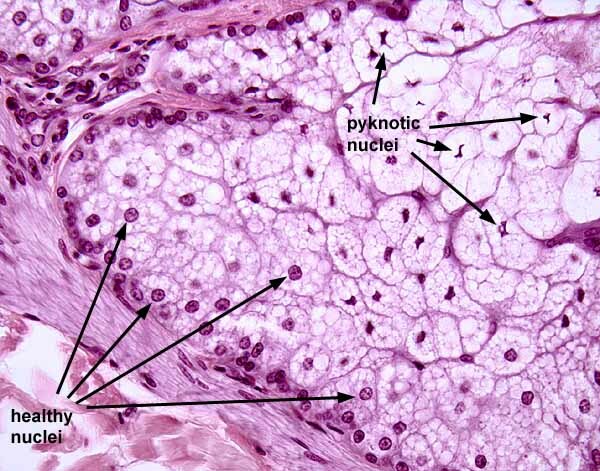 Cells along the base of the gland (lower left) are active, growing cells which are mitotically active (like cells in the basal layer of the epidermis). Sebaceous cells accumulate sebum (oils) in unstained droplets which fill the cytoplasm. As the cells mature, they are pushed outward toward the lumen of a hair follicle (toward the upper right). Along the way, the cells die. This is indicated by pyknotic nuclei (shrunken, intensely basophilic) in cells at some distance from the base of the gland. For a lower magnification view showing the associated hair follicle, click on the thumbnail at right.